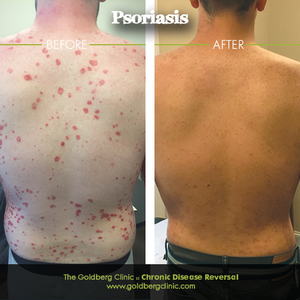 Harrison suffered from severe Psoriasis, an autoimmune skin disorder. Lesions were present on his face, scalp, arms, legs, torso and back. His skin itched and flaked which is characteristic of Psoriasis. He saw Dermatologists who gave him skin creams and drugs but his symptoms persisted. 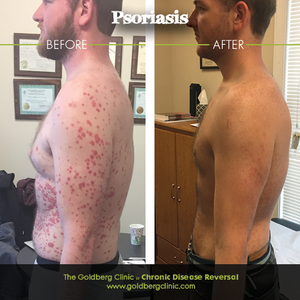 Harrison's skin has improved considerably in all areas since coming to the Goldberg Clinic as seen in the pictures below. Harrison shares his experience with us in the video interview to the left. Also see the article: "Skin Deep: A closer look at dermatological afflictions."